The Cleveland Cavaliers were able to hold off the Orlando Magic for a grind-it-out victory on Saturday by a final score of 131-127. It was a strong showing for Cleveland, who got ran off the floor at the TD Garden in Boston on Thursday. LeBron James led the way with 33 points, ten assists, and nine rebounds while Kevin Love contributed 27 points. Saturday was yet again another nice display for the returning Isaiah Thomas, who made his first start of the season as well as his Cleveland career. 1. IT Continues To Garner Excitement- Isaiah Thomas sprinkled in nineteen points on Saturday and once again gave Cleveland fans a reason to be excited about the future of this basketball team come June. Thomas zigged and zagged his way to the hole for a few highlight plays and looked mighty comfortable with the ball in his hands alongside LeBron. Thomas was able to maneuver his way around the court with a lot more ease than in his playing days with Boston, something that makes his game that much more dangerous. Thomas has scored 36 points in 40 minutes on the floor with the Cavs for nearly a point a minute. That’s wild in all aspects of the definition. As Thomas continues to get acclimated to his starting role and playing with LeBron, Cleveland will become even more dangerous. 2. Wade’s World- Dwyane Wade continues to impress in his bench role with the Cavaliers. When Wade first arrived in Cleveland, the idea of even sitting on the bench to start a ballgame was an afterthought to the former Miami Heat superstar. 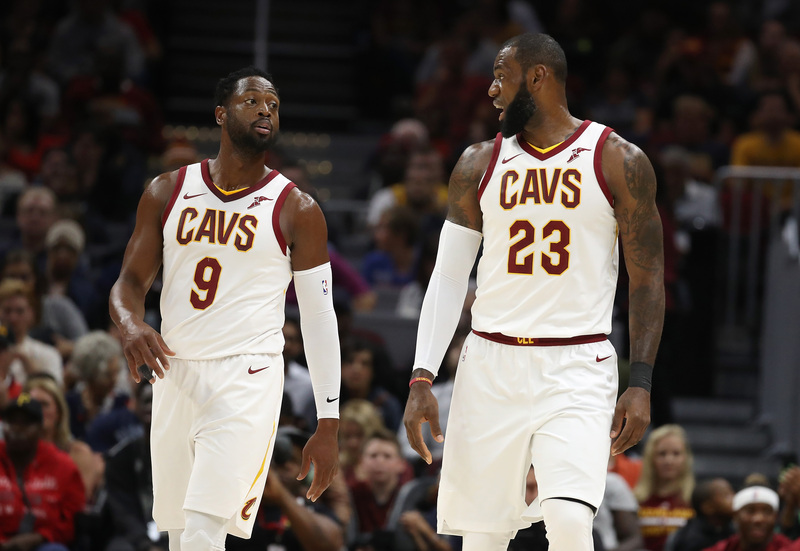 Being a sixth-man was foreign territory to Wade and he was not too overly thrilled when he was informed that he and JR Smith would switch roles with Smith taking the start at the two-guard. However, he has now made a trio of sorts with veteran teammates Jeff Green and Kyle Korver. Wade added sixteen points along with nine rebounds tonight and gave another spark against Orlando. Wade has created a case for himself being named the Sixth Man Of The Year at season’s end. It’s Wade’s world right now and we’re just living in it. Did #TheFirstCedi use the force to get this pass to @kevinlove?! Osman continues to push on through in his rookie campaign and is earning more minutes as the games continue to add up. While he still shows some bushy-tailed moments, Osman is certainly making strides in his first year of NBA basketball. How does Derrick Rose fit in the Cavs’ rotation? What Did LeBron James Think of the Browns ‘Perfect Season’ Parade?